College Coach? Click here to view all of Michael's information. Volleyball has always been a passion for me ever since I can remember. From peppering with my dad and learning what a "pancake" was for the first time to playing club and varsity volleyball now, I have known that I'd like to continue playing volleyball for as long as I can. I am truly open to any school and division, from Division 1 to the club level. I will work very hard, play with passion and enthusiasm, and strive to be the best I can be on and off the court. Personally, one of my primary values is that everything in life is earned, not given, and I will work as hard as I can to earn a chance to play for a team at the collegiate level. I also pride myself on my academics, and I can balance challenging coursework with volleyball. I am currently looking into film as a potential major, but I am also open to English, Writing, or Pre-Law as potential majors/programs. My competitive spirit and passion to constantly improve drive my work ethic and are the reasons I would like to continue playing volleyball at the collegiate level. Notes: Team ranked 9th in country by Volleyball Magazine. Earned 13th place in Open division at BJNC. Starting OH. Notes: Starting libero as a 12-13 year old on a 14U team that won 10 tournaments. 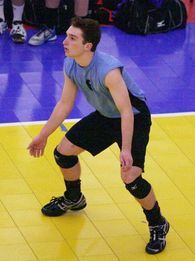 Starting libero on the Iowa Region team that earned gold medal in the Youth Regional division. Adversity 16U finished in 14th place in Open Division. Adversity 16U finished in 9th place. Adversity 15U finished in 13th place in Open Division. Adversity 15U finished in 9th place. Starting goalkeeper as a freshman on the sophomore team and as a sophomore on the JV team and member of the varsity team as a junior and a starter as a senior. Yes. Earned A's in all Honors classes including English I, English II, English III, Spanish II, Spanish III, Spanish IV, Algebra II, Pre-Calculus, Biology, Chemistry, Physics, World History, and U.S. History. Yes. Completed AP European History sophomore year; grade A with score of 5 on the AP exam. 1st semester junior year completed Calculus A/B with a grade of B+, and 2nd semester junior year completed Calculus A/B with a grade of A. High Honor roll all semesters. and Spanish club. Member of National Honors Society and founder/president of Cinema Club.